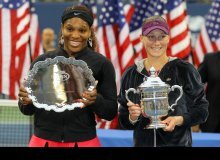 Congrats to Champion Samantha Stosur from Australia and to American finalist Serena Williams. BUT, What the US Open did was not cool, if I can borrow the words that Serena spoke to the chair umpire during the match. Serena Williams, the only American woman standing, ... the only American in the championship at the US Open last night, 9/11 of all days, lost in straight sets to Sam Stosur of Australia. The fact that all of the Americans lost at home is not my primary issue. That happens a lot at the Open. As a matter of fact, but for Venus and Serena, we would have lost the majority of all of the major tennis tournaments in the last 10 years. My issue is that on American soil, we are so fixated on money that we chose to ignore the best interests of the women players in this tournament. The weather made the Open a challenge to coordinate all last week. Rain delays made it impossible to get the matches in so that the finals could be played on schedule. That said, the women played the semi finals on Saturday- the day that is usually reserved for the Woman's Final Championship match. The women were moved to play the finals on Sunday-normally reserved for the men. The men played the quarters and semi finals on Saturday also, but they were given more than 24 hours of rest and will play their finals a day later on Monday, allowing them a good amount of rest before the final match. Great, I think the men need the rest, tennis is a grueling game. Hard on the body. But the women need at least 24 hours to rest between matches as well. Here is what happened. On Saturday, Serena played the #1 Seed Wozniacki after the men's match late Saturday evening. Knowing that the winner of the men's match would not play again until Monday afternoon, the USTA should have had the women play first and let the men play into the night. Instead, the women waited while the men played - time that they could have spent recovering and resting up for the Championship match the next day. This decision by the USTA proves that common sense is not so common. Billie Jean King, Chris Everett, Martina Navritilova, WHERE ARE YOUR VOICES IN SUPPORT OF WOMEN's tennis? Yes we now pay the women well, but do we have to kill their bodies in the process? Most tennis fans suggest that the decision was because the money to be made on a full day of tennis is more important to the USTA than one unlucky American female player. Why couldn't the women play on Monday giving them the same amount of time as the men to rest. Was it that the USTA wanted to cash in on the Sunday matches? Is is because it is only woman's tennis- no big deal to the USTA or the fans? Is this typical of women's sports? I heard no outcry about this from the commentators male or female. I did not hear any of the women players protest either. Am I the only person who sees a major problem with how the US treated possibly the best American female tennis players in the history of the game? I dare not play the race card, but I must ask this question, had this been Lindsey Davenport, Jennifer Capriotti or the true darling of American women's tennis Chris Everett -would the US Open/USTA have made the same decision? I am just asking. Women continue to have to fight for equality in professional sports. Even the prize money was unequal for years. The Australian Open started paying women equal prize money to the men in 2000. The French followed and reluctantly Wimbledon followed suit as recently as 2007. The US Open who has paid women equally for over 3 decades still thought it not robbery to make the women play stressful matches back to back. After I ranted and raved at the television about Serena's loss, I took a step back and watched her response. When Chase reps handed her a check for more than half a million dollars, she grinned like a Cheshire cat and talked about how great her opponent played. And her opponent did in fact play great tennis, but, Serena's level of play was not the same as it was throughout the entire tournament. So, what changed? Serena was visibly pooped. Beat down. Exhausted. Worn out. Mind you she didn't show it physically, but it showed in the way she played. It doesn't seem right to me, and it certainly was not cool. 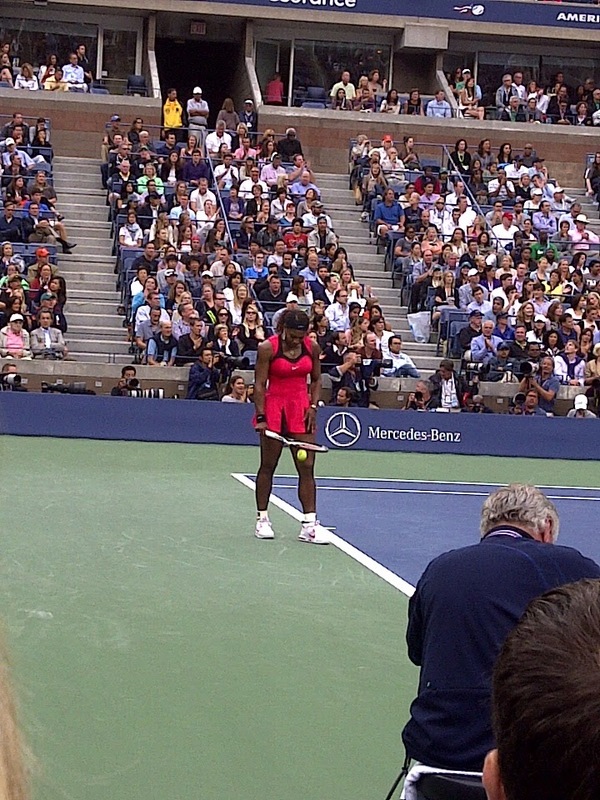 In the second set, Serena was down a set and fading fast into the second set of the match. She was trying to boost her own confidence and she hit a winner- or so she thought, and yelled to herself "C'MON"- as loud as tennis players yell when they get excited. Problem was that the point was not yet officially over and therefore was not yet a winner. The chair umpire penalized Serena for screaming during the point and gave a very critical point that would have been Serena's to Sam. Serena was clear about telling the umpire: "You have it in for me and I promise you, that is not cool." What the US Open did to the women last night, it might not be cool, but it sure does pay well. As I watched Serena accept her check with a grin as wide as the Brooklyn Bridge, and her gorgeous diamond earrings glistening in the moonlight, I thought let me get back to work helping women understand how to help their children achieve excellence in life through sports. (Single Mother the New Father, Volume 1 : Sports, by Cathleen Williams). Serena's parents did a great job helping her keep focus. 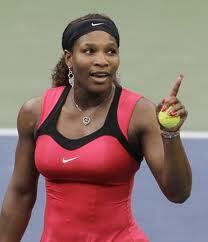 Many American's wanted Serena to win last night. I know I did. We can harp about how uncool so may things were, but at the end of the day, she was paid very well and she will be back next year. We can and should write to the USTA in support of the women on the tour, regardless of their race but in the meantime, let's get something positive out of this experience. What is the lesson? Serena understands how to play this game- literally and figuratively. It is truly a reflection of life. How are you using this experience to help you or your children understand what happened to her last night? Did you explain this life lesson to your boys and your girls? Did you encourage your daughters to see the inequity and to stand up for the women and for themselves when they see injustice, but to not let it ever stop them? Did you encourage your boys to see the similarities in how the women were treated here and how women are often treated in other institutions in their lives? Did you show them that it is not the way they should treat women blindly without seeking the equity in all situations? Furthermore, unless they are writing a letter to the USTA, there is no point in wasting time being upset over Serena's close to a million dollar loss? Instead teach them to be great sportsmen and women like Serena was last night, and show them that they should always be prepared to win. The most important thing however is that they show up. Take the time to provide them with the training they need to compete effectively in their sport and in life. Show your children what it takes to get to the top and how to conduct themselves when they get there, despite the inequities they may face. 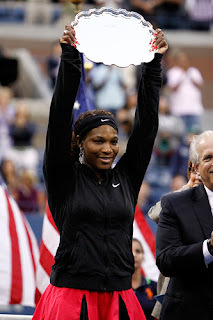 There are very few Americans that made it to the semi-finals of the US Open and Serena was the ONLY American to make it to the Championship. That in itself is a lot of pressure. Add that she is the only black American to get past the round of 16 male or female, and the only black woman besides her sister in the woman's tournament and you get even more pressure. The Williams sisters are the only black women to win a major tennis tournament since Althea Gibson. Gibson, the first black woman to win a major tennis tournament won the French Open in 1956 and both Wimbledon and the US Open in 1957 and 1958, that was over fifty years ago. Did you know that a black American male has not won a major title since Arthur Ashe who won the US Open in 1968, the Australian Open in 1970 and Wimbledon in 1975? Did you know that Arthur Ashe is the ONLY black American male to ever win a grand slam? Surprising huh? What can your children - whatever their race, learn from those facts? I wrote a book to help women learn how to effectively use sports to raise their kids, Single Mother The New Father, Volume 1: Sports. If women took advantage of the sports world and understood how much it could help their children, an entire industry could open up to our kids. In this time of economic crises in the United States, it is important to use everything at your disposal to help your children be successful. Sports can help them get a better education, and as shown by the way Serena handled herself in the end last night, it can teach us all an awful lot about life. Just as in life, it is all how you handle yourself, and how you look at things. When you handle the worst of situations and you don't let the situation handle you, even when you lose, you win. Thanks Serena, you taught us well. See you next year! I wasn't able to vote but I certainly want to voice my opinion. Although we have come a long way in women's sports...we have still a tremendous journey ahead of us. We can have a discussion all day about women's tennis, soccer and oh my the WNBA! Excellent post! As a man, I do agree that there is plenty of inequality in sports when it comes to gender. I actually think that the women's game is more entertaining than the men when it comes to tennis. Men's tennis hasn't been good to me since McEnroe retired. I hate how the women's game is turned into a reality show with all of the emphasis on outbursts. Although I do wish that Serena would handle herself more professionally, it's still unfair when compared to the emotional outburst of men.